The indices gapped up on Monday and rallied till Tuesday to reach the 38 % retracement level, and that was already the whole wave [ii]. On Thursday the SPX had plunged more than 3%, one of the worst days since months. Yesterday, the SPX had declined further and made a new low at 1044,50 before it rallied in the last hour about 2 % and closed at 1066,18. 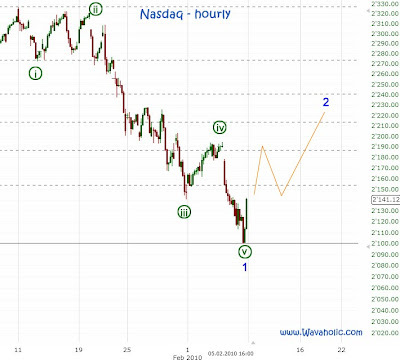 Back in May 08 this second wave only retraced 38 % as well. 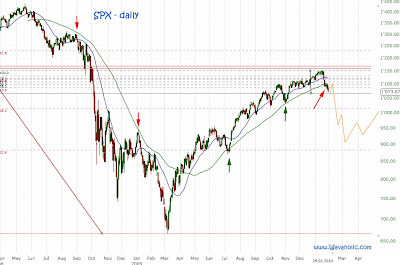 What followed can you see on the first chart: bears and bulls were waiting for a bigger retracement which never came, not until Minor 1 of Intermediate (3) bottomed more than 200 points lower. In my January update I wrote that I expect a retest of the broken MA 76 from below. The MA's I'm using may be strange for you but I've been using them for a long time and so far they've worked. I'm testing some new strange MA's at the moment... : ) and I wouldn't be surprised if the MA 322 will be the bottom for the first wave down. This MA is currently sitting at 950 and rising less than 1 point a day. Minor 3 is underway with a target of 980 and the first subwave (Minute [i]) bottomed on Friday. 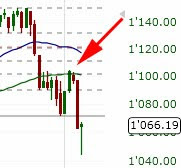 Minute [ii] may go up above 1080 on Monday but mustn't go above 1105, the Minor 2 high. If the market went above that level it would look very bad for the bears because the structure we've seen so far could have been a simple zigzag (1070-1105-1045) and we'd be at the beginning of a big upmove. 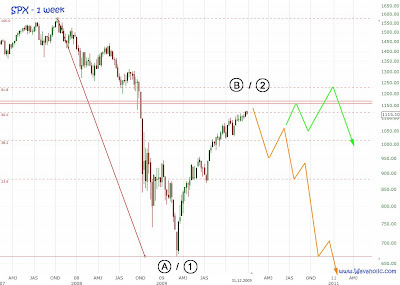 I posted the following chart in early January and explained the two possible counts for this year: "If this move down unfolds as any corrective pattern (i.e. only three waves) we can expect another rally up to 1200 or 1300 for the rest of the year." Minor 1 bottomed on Friday and Minor 2 is underway. Only an alternative count because it doesn't work for the Dow/SPX. 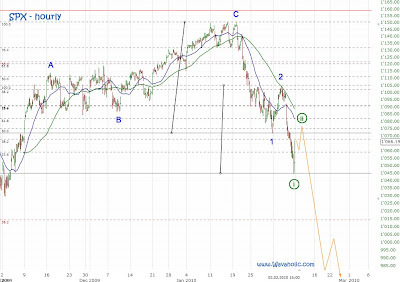 But if we assume that this is only Minute [iii] and expect normal third waves (1,62 times first waves) we get a low of 660 only for Intermediate (1), a second wave should retrace to around 940 and then the third wave leads the market to its biggest crash in history, a plunge below 150. These calculations are based on perfect waves with common retracements for second and fourth waves and I'll be able to make calculations which are more accurate as soon as this first wave down bottoms. Monday, Tuesday up to 1080, then down in wave 3 of 3 towards 1000.